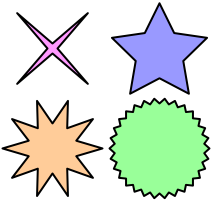 A slight modification / simplification of my Pie Chart script for OmniGraffle lets you draw stars of varying styles. Latest version: Works with OmniGraffle 4. In OmniGraffle open a new document and select > Star. In the first window that appears, enter the number of points your star is to have, like it says. The following window asks for 'star pointiness'. Something between 0 and 100 is what it's looking for. 50 makes for a nice sensibly pointy star, not too sharp, not too blunt. Small children should be supervised when using any star with a pointiness of more than 70. If you draw a 'star' with around 30 or so points, and set the pointiness to zero, you end up with what looks like a nice smooth circle. The interesting thing about this is that you can delete points from the 'circle' to make flattened areas. Mmm. Flat circles. All your snow-globe drawing fantasies come true at once. Putting in values larger than 100 for the pointiness has somewhat unpredictable results. They still look a little star-like I suppose. Some people have noticed that the script may not run when selected from the menu when using OmniGraffle 3.1.2, and only works when opened from the Finder. 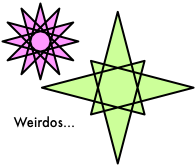 This was due to a change in the way Script Editor and OmniGraffle work together. Using OmniGraffle 3.2 or later fixes the problem. Multiple stars are always drawn in the same place. Best to move your star once it's been drawn if you are doing more than one. Make multiple stars not all draw one on top of the other. Now works with both OmniGraffle 5.0. Now works with both OmniGraffle 3.2 or later and with 4 beta 1 and hopefully later betas. Needed modification for version 4 to support the changes to drawing shapes with the addition of the Bezier curves feature. Pointiness is now a percentage (i.e., 0–100) rather than a ratio (0–1) like it was in the previous version. Initial release. Apparently works with OmniGraffle versions 3.2 beta 1, 3.2 and 3.2.1. Should also work fine with corresponding Pro versions of OmniGraffle.